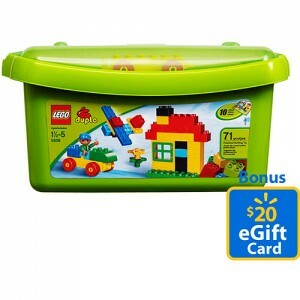 What a GREAT DEAL, Walmart has Lego Duplo Bricks and More Bricks priced at $29.00, plus you’ll receive a $20 Walmart.com eGift card with purchase via email that you can use as a gift or to purchase something else! You can get FREE Site to Store shipping — or pay $0.97 to have it shipped to your doorstep. eGift Cards are sent via email. Can only be used at Walmart.com and samsclub.com, and are not redeemable in Walmart stores.